The manuscript begins simply enough: "I first met Neal not long after my father died." 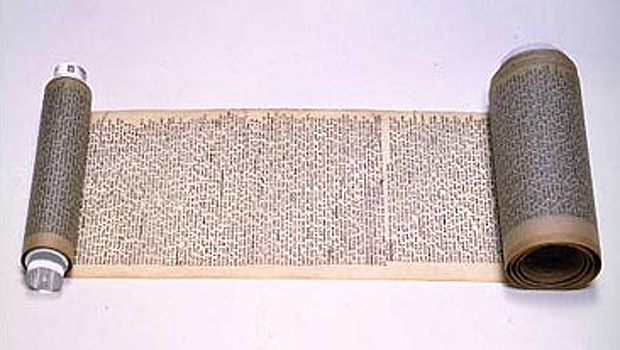 The conclusion, once located at the other end of a 120-foot long scroll, is a different story. It's missing, rumored to have been chewed by a dog, an alibi seemingly supported by the stains and jagged tear across the final page. The tale that flows in between, pounded out in single-space type on paper made yellow and brittle by time, is the American classic "On the Road," written by the godfather of the Beat Generation, Jack Kerouac. For the first time, fans of Kerouac and beatniks old and new have a chance to see every word, edit and smudge of his original manuscript, unrolled end to end and under glass at the University of Iowa Museum of Art. It is the first time during its international tour that the yellowed and brittle manuscript now owned by Indianapolis Colts' owner Jim Irsay has been shown unspooled. "This is the first time people anywhere will be able to get the full effect of the work," said Howard Collinson, the museum's director. "It does have the character of a piece of artwork, like some kind of performance art. But at the same time, I don't think it was an act of convenience that he put his novel together this way." During a 20-day stint in 1951, Kerouac hunkered down in front of a typewriter at a friend's New York apartment. Hopped up on coffee and Benzedrine, he began retelling the tale of the aimless trek he made across America. In a spontaneous, stream-of-consciousness burst, Kerouac typed away on long sheets of tracing paper, taping each finished page to the previous one to form one continuous, rolling text. Published six years later, "On the Road" won the praise of critics and won Kerouac instant fame. The book also became the icon of the post-World War II subculture of intellectuals, writers, musicians and rebels, the beatniks who identified with the freedom of his cross-country odyssey and embraced Kerouac's disdain for the conformity, materialism and political convention of the 1950s. After his death in 1969, the scroll bounced around, spending time some say in a dorm room closet, before landing at the New York Public Library. In 2001, Indianapolis Colts' owner Jim Irsay bought the scroll for $2.43 million at an auction, then decided to dispatch it along much of the same path that inspired its author. "In part he feels like a caretaker, but he also feels a responsibility to share with people something that was so influential on a generation," Jim Canary, hired to take care of the scroll, said of Irsay. The manuscript, attached at each end to acrylic spools, just arrived in Iowa City from Rome, Italy, where Canary said it was read nonstop as part of a performance by a group of Italian writers and actors. Currently, it is on display inside a freestanding metal case covered with Plexiglas. From a distance, Collinson said the scroll highlighted against the museum's dark, concrete floor fittingly resembles the white center line of a highway. The display is accompanied by background music from the era's jazz greats like Charlie Parker, Ornette Coleman and Dizzy Gillespie. There is also a film featuring snippets of influential movies of the period and an audio recording of Kerouac reading excerpts from the book nearby. The exhibit will be on display through March 12, before a run at the Las Vegas Public Library, March 24-May 15.